The Vanguard Knights took the field for the first time under first-year head coach Edwin Farmer in their spring game Friday night against Lakewood. Vanguard and Lakewood played two quarters of varsity action and the Knights needed every second to put points on the board. On the games final play N’Kosi Perry found Eddie Jackson on a 16-yard touchdown pass for Vanguard’s only score. Perry was a bright spot for the Knights offense passing for 88 yards and rushing for 32 yards. Lakewood won the varsity contest 14-6. The Knights JV squad was unable to find the end zone in their 14-3 loss in the JV portion of the spring game. 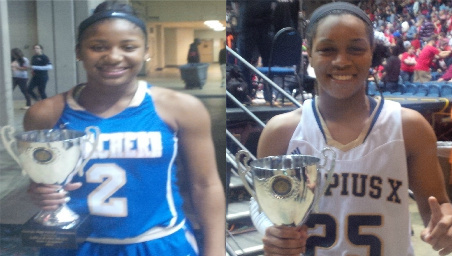 Te’a Cooper led the 6A McEachern Indians to their second state championship in three seasons this past spring while Asia Durr led St. Pius X to their second straight state championship in class 3A. Both represent Georgia on the 12-player USA Basketball Women’s Under 17 National Team roster this summer. Georgia-behind Cooper and Durr, joined Texas (4) and California (2) as the only states with multiple representation on the roster. Georgia sent 12 players to the trails with 11 competing as Cooper’s teammate Caliya Robinson did not participate due to injury. Durr, regarded by many recruiting services as one of the top recruits in the country, won a gold medal last year while on the Under 16 team. Cooper, a top 50 recruit by multiple recruiting services, did not make the cut last year for the U16 team and will be making her first national team appearance. Both players will be entering their senior season after national team play. The team will convene again for training June 12th through June 17th in Colorado Springs, Co before leaving for France to continue training on June 19th and compete in an exhibition tournament June 20th-22nd. USA will play in Pool D when 2014 FIBA World Championship prelim round begins June 28th, the Round of 16 will begin July 2nd with the gold medal game on July 6th in the Czech Republic. The Under 17 team will be seeking its third consecutive world championship. The complete U17 schedule is here. Lambert is still a fairly new school located in the north Metro Atlanta suburb of Suwanee, GA. They etched their name in the records books in only their fifth season defeating defending 6A champion Milton 2-1 in Game 3 of the best-of-three championship series, winning their first-ever state championship in baseball. The squads split the first two games last weekend with Milton taking Game 1 2-1, Lambert took Game 2 5-1. Kyle McCann had the historic RBI single to score Jarrett Wright in the fifth inning giving Lambert the 2-1 lead, which held up for the victory. Lambert entered the championship series averaging 8.8 runs-per-game in the playoffs but were held to five runs total in the series. Milton (28-9) entered the season with hopes of defending their state championship and making a run at a possible national championship. Those hopes went by the wayside early in the season after injuries hit the team followed by losses. The Eagles are currently ranked No. 20 in the latest Max Preps Xcellent 25. The Longhorns (36-2) suffered both of their losses in the state tournament to Mill Creek and Milton and have been highly-ranked nationally most of the season in several baseball rankings. Winning the state championship will only enhance their opportunity at winning the national championship. Lambert is currently ranked No. 1 in the USA Today Super 25 with their next rankings will be out June 3rd, No. 2 in the Max Preps Xcellent 25 and No. 3 in the last Baseball America rankings on May 20th. Lambert ended the season with a run differential of plus-240. Whitewater (GA) entered the Baseball America Top 25 at No. 23 in their latest rankings from May 20th. Whitewater fell to Houston County in their best-of-three 5A championship series 2-1. Houston County won Game three 8-6 to win their first-ever state championship in baseball. Lambert and Milton are headed to a decisive Game 3 in the Georgia 6A baseball state finals. Milton is the defending champion but Lambert is in line for a high finish in the national polls and possible national championship. Lambert won the first game of the three-game set 2-1, while Milton responded with a 5-1 win in Game 2 forcing Monday’s decisive game 3 at Milton. The Milton Lady Eagles added their 8th lacrosse championship to the trophy case with a 16-13 victory over Walton in the Georgia 6A finals. It’s the 5th straight state championship for the Lady Eagles. Milton’s Brooke Winsness and Emily Velez accounted for 8 goals, scoring 4 apiece in the victory. Milton defeated Hillgrove, West Forsyth, Centennial and Walton in the state tournament averaging 18.75 goals-per game and scored 20 or more goals twice in the postseason. Milton finished the season 19-3 and are ranked nationally at No. 10 in the Max Preps Xcellent 25 and No. 12 in the USA Today Super 25. The latest ranking by each service will be released on Tuesday. Milton also comes in No.25 in the LaxPower Computer Rankings. The Lax Power final rankings will not be released until the conclusion of the national high school season in July. The Lambert Longhorns baseball team will try to do what their schoolmates on the lacrosse team were unable to do this past weekend, win a state championship. The Longhorns (34-1) will open their state championship series against the defending Georgia 6A champion Milton Eagles this weekend. Lambert was ranked as high as No.2 nationally before losing their first game in the second round of the state tournament to the Mill Creek Hawks. They went on to win the best-of-three series but fell completely out of the latest Max Preps Top 25 released on Tuesday. Montverde Academy (FL), Greater Atlanta Christian (GA), Sagemont (FL) and Orlando Christian Prep (FL) all remain ranked nationally in the Max Preps Xcellent 25. GAC is facing Benedictine in the Georgia class 2A finals, Orlando Christian Prep was knocked out in the Florida 2A semifinals. Despite the loss Lambert remains ranked in the Baseball America Top 20 coming in at No. 3 after sweeping No. 7 Parkview in the Georgia 6A semifinals. Lambert has swept three of their four state tournament opponents. They enter the state championship series averaging 8.8 runs per game in the postseason scoring 10 or more runs in four of their nine state tournament games. South Dade (FL), American Senior- Hialeah (FL), Creekside-St. Johns (FL) and Whitewater (GA) all are nationally ranked in the Baseball America Top 20. South Dade won Florida’s class 8A championship, American Senior won Florida’s class 7A championship, Creekside is in the Florida 6A semifinals and Whitewater will face Houston County in the Georgia 5A finals. The Florida (Gainesville area) Stingrays opened their summer season in the GDFL on the road against the Georgia Knights in Atlanta. After a scoreless first quarter the Stingrays were able to break the ice by scoring on a Anthony Gay II 7-yard touchdown run for a 6-0 lead after the PAT failed. The Stingrays would add another touchdown later in the second quarter on a 7-yard touchdown pass from Micheal Tanner to Miles Harris for a 14-0 led after Tanner hit Gay II for the two-point conversion. The Stingrays (1-0) have a bye week before opening a three-game home stand at Citizens Field in Gainesville against the Florida (Jacksonville area) Falcons, Georgia (Middle Georgia area) Crush and Georgia (Metro Atlanta area) Knights. For more information on the Florida Stingrays visit their website here. The four remaining nationally ranked boys soccer teams from Georgia all advanced to the state finals and all hoisted state championship trophies after the dust settled from the finals. Following top-ranked McIntosh’s 8-1 blistering of Houston County, the tone was set for the rest of the field. GAC, the next highest ranked team from Georgia, completed their undefeated season with a 3-0 victory over Westminster to win the class 2A state championship. Ryan Marcno led the Spartans with two goals and Kelly Jones added another. Greater Atlanta Christian finishes the season 23-0, ranked No,1 in class 2A in Georgia and No.3 nationally in the NSCAA Top 20. Justin Macias and Javier Rodriguez scored Dalton’s only goals in the Catamounts 2-0 win over Johnson-Gainesville. With the win Dalton is unbeaten in their last 44 matches, the lone blemish was a tie last season. Dalton finishes the season 22-0-1 and are 44-0-1 over the past two seasons. The Catamounts are ranked sixth nationally in the NSCAA Top 20. Brookwood is ranked ninth in the NSCAA Top 20 and had to get by cross Gwinnett county foe Mill Creek (18-3) in overtime in the 6A state finals. Mill Creek was making their first-ever state championship game appearance and were more than just showing up at to the party. The Hawks broke the ice of a scoreless contest with a goal from Jack Giles for a 1-0 advantage. Brookwood (22-1) answered moments later with a goal from Jordan Locke tying the game at one with just over 4 minutes left in remaining in regulation. In the extra session Alfredo Rivera’s goal gave the Broncos a 2-1 lead and they would hold to win their third state championship and first on 10 years. The updated spring NCSCAA Top 20 poll will be released on Tuesday My 20th and all four teams look to be safely in the top 10 with McIntosh in line for the national championship. The McIntosh Chiefs completed their second consecutive undefeated season defeating the same squad they did last season for the Georgia 5A state championship. Houston County is a well-respected soccer program that churns out quality talent in the middle Georgia area yet can’t find a way to get by the nations No.1 ranked club. Didrik Cooper-Siep took over in the second half for McIntosh by putting up his own hat trick giving McIntosh a 6-1 advantage as they would go on to win 8-1. McIntosh finishes the season 21-0 , outscoring state tournament opponents 28-2 in the process. The victory all but locked up McIntosh’s national championship bid as they’re currently ranked No.1 and been all season in the spring NSCAA Top 20 rankings. The final rankings will be released on May 20th, McIntosh should retain the top spot.